Essex Post-1969 record; VC18 1970-on record; VC19 1970-on record. The Stag Beetle is an Essex and UK Biodiversity Plan species. It is the largest beetle found in the British Isles and males have huge jaws. The head and thorax are black with chestnut brown wing cases. 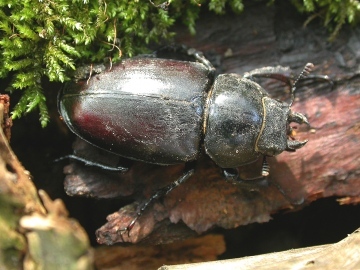 Females are smaller and do not possess the large jaws, but are still much larger than the Lesser Stag Beetle Dorcus parallelipipedus. Stag Beetles breed in rotting and decaying wood and the larvae can take up to four years to mature. The species is widespread in Southern England and in Essex there are two distinct population centres in N.E. Essex and S.W. Essex. As well as semi-natural habitats it is found in urban gardens and parklands.